Video: Huge Baby and Toddler Clothing Haul! I hate the word “haul” but I’m not sure what else to call this video other than “Ruth shows you the mountain of baby clothes that has been accumulating in the corner of the room”. 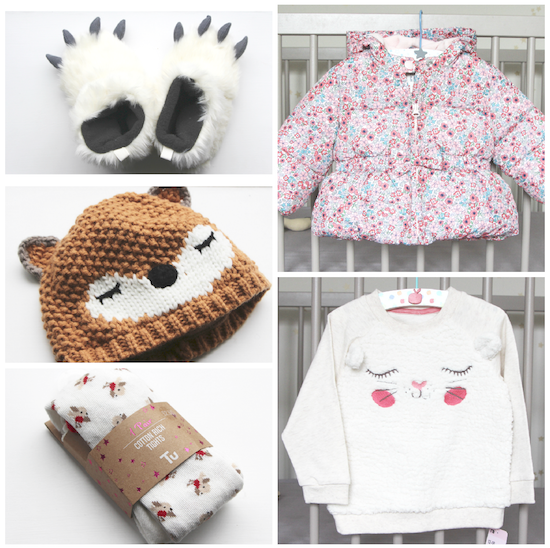 Do enjoy – there are some real gems here, including the Liberty-esque-print hat and gloves from Sainsbury’s and the monster feet slippers from GAP! Everything shown is listed and linked to beneath the video screen. HM Pink Dress – can’t find this, maybe in store?